Performers include: Max Wright, Anne Schedeen, Andrea Elson, Benji Gregory, Paul Fusco, John LaMotta, and Liz Sheridan. 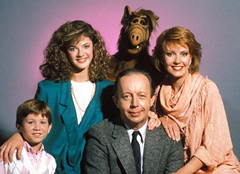 A popular 1980s sitcom that centered around Gordon Shumway, an alien nicknamed ALF (Alien Life Form), who crash lands into the garage of the Tanner family. The Tanners hide ALF from a government task force as well as from their nosy neighbors to keep him safe. Unfortunately, ALF is a lot to handle and frequently causes problems for the family as he becomes acclimated to his new planet. The Tanner family includes social worker Willie (Max Wright), his wife Kate (Anne Schedeen), their children Lynn (Andrea Elson) and Brian (Benji Gregory Hertzberg), and their cat Lucky (whom ALF would dearly love to devour). While trying to contact Australia on his radio in the garage, ALF makes contact with Skip and Rhonda, other survivors from his world. They’ve purchased a planet and want to make it a new Melmac. They’re approaching Earth and invite ALF to join them. Though he has mixed feelings, he make plans to go with them. What ALF doesn’t know is that the US Military has discovered the radio transmissions and are tracking them. The Tanners throw ALF a farewell party and, after he packs his belongings (and a few of the Tanner’s), the family takes him to the desert landing site. As they hear the spaceship and see the lights in the distance, the Tanners and ALF each hug goodbye. The family waits by their car while ALF is enveloped by light. But, before he can be brought aboard, military vehicles converge on the site. The spaceships speeds away and ALF is surrounded by members of the Alien Task Force, while the Tanners look on helplessly. The episode ends with “To be continued” on the screen. First aired: March 24, 1990. ALF has returned several times since the end of his sitcom, including in a made-for-TV movie that shows the alien in military custody. You can read about the various returns here. I would love to see ALF on the CW.